What more is there to say about Harry Potter, particularly the first book in the series? 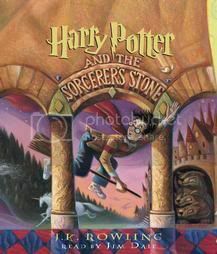 Harry is terribly mistreated by his relatives and has a generally miserable life, until he finds out he is a wizard. The discovery is slightly bittersweet when Harry finds out that his parents were brutally murdered by the now-disappeared evil wizard Voldemort. It may be that I’ve finally just read this series too many times. I’m starting to see things that don’t quite line up throughout (I blame Michelle for pointing out inconsistencies in book 7 when we watched the movie). I was also struck on this reread at just how ridiculous the opening scene with the Dudleys really is. They might as well have been tying Harry to a railroad track and twirling their mustaches. Honestly, it sort of annoyed me a little. Eventually I was able to get back into the book, but it took longer than usual. I’ve listened to the rest of the series in audio narrated by Jim Dale before and been impressed, but at times during Harry Potter and the Sorcerer’s Stone I distinctly heard Dale make mouth noises, such as lip smacking, which sort of disgusted me and turned me off. I was all excited about going through the series again, but now I’m feeling sort of blah about it. Anyone up for convincingme? 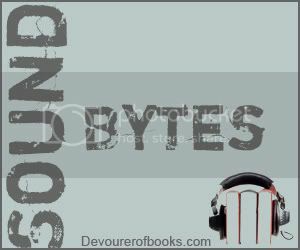 Are you a blogger who reviews audiobooks? Whether you review them regularly, occasionally, or exclusively, there’s a new place to find free review copies for your perusal. The site is called Audiobook Jukebox and we’ve recently started a new program called Solid Gold Reviewers. The idea is to have a place where audiobook publishers can offer titles for review and reviewers can select those titles which interest them the most. At the beginning of this month, 9 publishers helped us get started by offering 42 titles and over 100 copies for review. I’d like to invite you to check out the guidelines and then take a look at the titles listed. I hope you’ll see something interesting to listen to and review. If not, check back next month (we already have some additional publishers who’ve said they’ll contribute). If we all participate, more publishers will contribute more of the audio we love. In turn, we’ll have the chance to tell others about more great listens! I totally raved about 2-7 in audio two years ago, but for some reason this one held no magic for me. People have been after me to read this series for years and years. I was considering audio, but it sounds like a no, at least for the first book. My Sound Byte is the opposite this week. I loved the narrator and was meh about the book itself – but only after the book was over and I reflected on it. One of the few times that’s happened. I just finished re-reading this one this morning, I think for the third or fourth time, although not for quite awhile. The first three are all pretty simple books — you can see a lot of the world-building in this one which makes it less exciting than some later books. Even so, I still get teared up at the end and loved reading it. I’m not sure if I’ll try and of them on audio — maybe. Keep going! I loved going through the series in audio last year. I don’t care about the inconsistencies (ok – I care a little), Harry Potter IS magical. I guess I always thought that Harry’s adopted family and life as a child was a charicature than anything based in reality. It just adds to that overall magical feel to the story. And ignore the inconsistencies! It is all about the fun! Go with Stephen Fry. Seriously. I know a lot of people love Jim Dale but I by far prefer the British version with Stephen Fry. Unfortunately I have no idea where to get them other than Amazon, and I won’t buy them there. Maybe Pottermore will have them as digital downloads when they have the ebooks, I would vastly prefer that. I listened to this audiobook a couple years ago and it really left me cold for a number of reasons; but mostly I just didn’t care for either the writing or the narrator. Blasphemy, I know! I’ll have to post a Flashback Friday about it sometime… Maybe I’ll try again with the Stephen Fry-narrated audiobooks if, like you I could get them without having to go through Amazon.